Are you interested in financing your next equipment purchase? 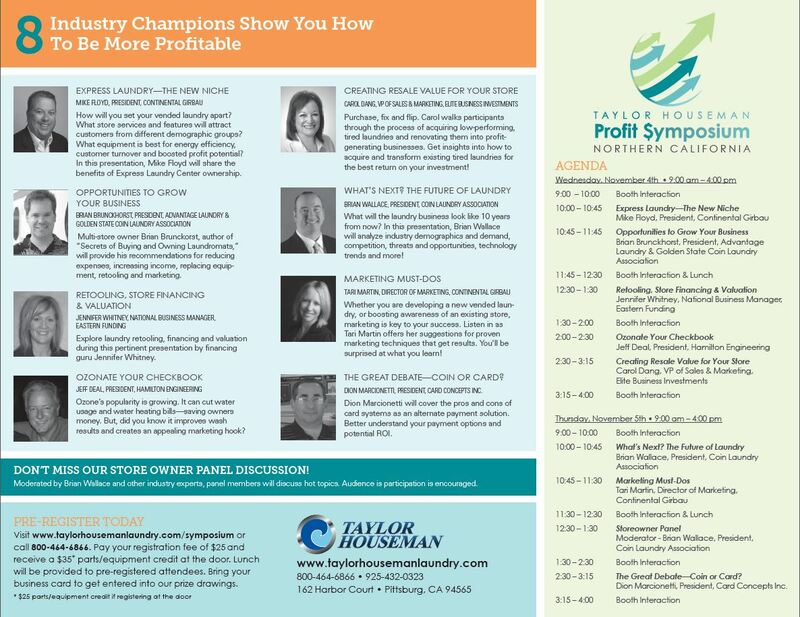 See what we have in store for our 2015 Profit Symposium. Registration fee of $25.00 is returned to you as a $35.00 parts credit good for up to 90 days. Don’t miss this amazing opportunity to learn from Industry Insiders, Manufacturers, Distributors, Coin Laundry Business Owners and meet the Taylor Houseman team. Register today for the 2015 Profit Symposium. Call 800-464-6866 to reserve your spot! Click to see our agenda and guest speakers. Laundry fires are one of the more common incidences reported. Most of these are associated with the dryer. Don’t believe us? Open up another tab and Google “laundromat fire”. You will find a flurry of articles about laundromat fires happening all over the country. 1. Whenever dryers are in use the laundry should be staffed and clothes dryers should not be left unattended during operation. 2. Clean washer and dryer lint filters after every use. 3. Install the proper dryer hose vent and outdoor vent and clean them regularly. Remember that long screws holding the venting together can also catch lint, so most dryer manufacturers recommend using pop rivets when putting venting together. 4. Screens of any type, should never be put on your dryer vents. 5. Be sure that the washer and dryer are plugged into suitable electric outlets and that your machines are the correct voltage for your facility. 7. Fire extinguishers should be on premise and clearly marked so that even a first time visitor can find it.